Article 33 of the Constitution of Nepal has included the right to employment as fundamental rights. In order to implement the same fundamental rights, the Employment Act, 2075 has also been issued. Nepal government has announced employment opportunities through policy and programs and budget of the current fiscal year 2075-76, in the next five years, any Nepali citizen will endorse the situation that will go through foreign employment. Public development-related programs and projects have been operated from the relevant ministries and bodies under different levels of government. Thus, different bodies have not given reasonably prioritization to employment creation while conducting development-related programs and programs. A provision regarding the rights of employment, 2075, will establish an employment service centre at every local level, identifying and listing unemployed and provide employment opportunities for the minimum of 100 days. Nepal government has to provide a payment of 50 per cent of the minimum wages for each unemployed family to work for one hundred days working. Therefore, there is a need to create more internal employment as integrated, coordination and coordination in public construction and other public works including commercial agriculture, irrigation, drinking water, river control, forest, tourism, traffic infrastructure, to ensure minimum employment. 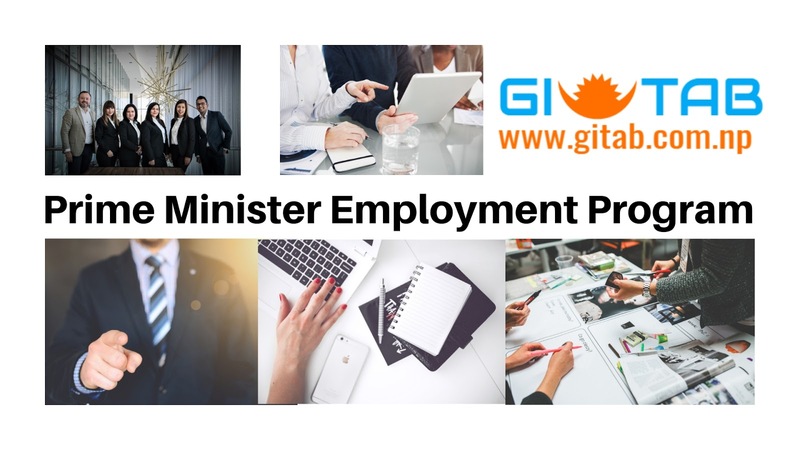 In this situation, the Government Employment Program is going to be operational in order to organize adequate employment in the public construction and public sector programs of the government, local government and local level. In such cases, employment will be developed through the employment service centre, as well as the demands of labour in the public sector development programs and the demand of workers, as well as mechanisms for demand and supply of labour at all local levels. This mechanism will also be involved in the role of facilitating and combining among the demands and supplies of the workers in the local, private, cooperative and non-government sectors. Additional employment opportunities will be created in those areas by coordinating and collaborating with private, cooperative and non-governmental sectors under the Prime Minister's Employment Program. Workforce and skill development training programs will also be operated under this program to reduce the difference between demand and supply of workers seen in the market because of the capacity of the workers and due to lack of labour. This program will also be made through the program to provide special entrepreneurship to the skills and entrepreneurship of the unemployed people based on thinking, skill and experience, and to provide adequate loan assistance, based on the evaluation of the concept of enterprise. Apart from this, will be conducted nationwide, including the "program of honour, nation's campaign," to develop a culture that respects work. See here: Job Opportunity for Job Officer and Nayab Subba at Prime Minister Employment Program. Keywords: Prime Minister Employment Program, Job Opportunity in PMEP, Job Opportunities Minimum of 100 Days, Employment Officer and Nayab Subba.